Some of our brothers and sisters have found themselves in a downward spiral that could end in premature death if a fundamental change doesn’t happen: getting & remaining clean. It’s easy to pontificate about the necessity to get and stay clean “or else,” perhaps even trying brow-beat someone into change hoping to trigger a desire to live more healthily. None this works. The simple thing is to allow God’s grace to work and to have a clean environment to live and work, to provide competent professional help and to make opportunities available for substantive change to happen. One more ingredient in my book that’s essential and a non-negotiable is the spiritual. Prayer, spiritual direction and fidelity to the witness of the Church goes to the root level of human desires and happiness given us by Divine Providence. But we have to admit that unless a drug addict wants to change her life no amount clever argument or cute programing is going to matter. If a person doesn’t take his human heart (his desires) seriously, including his need of happiness, then there is little we who aren’t captured by addiction can do. The Franciscan Friars and Sisters of the Atonement have opened their friary, St Christopher’s Inn, in Garrison, New York for drug habilitation for the homeless. The Franciscans have developed a culture of life for those who are vulnerable and weak and hoping to live differently. Last Sunday (August 16) the NY Times ran an article about the work of a farm sponsored by the friars and sisters along with the laity who collaborate to make change possible. The setting is an organic farm where the slow yet determined life of plants provide the metaphor for conversion: ground prepared, seeds planted, soil and plants watered, hoed, weeded and hoping for a harvest. Please read the article and watch the video clip provided therein. Father Paul Wattson, the founder with Mother Lurana White, of the Franciscan Friars and Sisters of the Atonement, gave hundreds of sermons, conducted numerous retreats, delivered many radio addresses and wrote extensively in four magazines: The Pulpit of the Cross, The Lamp, The Candle and The Antidote. The following piece is Father Wattson’s commentary on the feast of Our Lady of the Atonement. 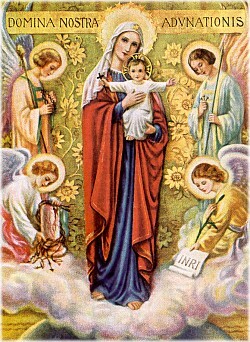 This Marian feast was approved by the Holy See in 1946 but it was first observed in July 1901. The theological datum on atonement and therefore mercy, is near-and-dear to the heart of the Church and indeed to all Christians, so today’s feast is apt. Let us pray for each other! I am writing this letter on the day which we are accustomed to observe at Graymoor in special honor of Our Lady of the Atonement. This particular name of Our Blessed Mother is very dear to us and we believe it is dear to Our Lady herself. We hold it as among the most treasured and sacred traditions of our Institute that it was the Blessed Virgin who first taught us to call her by that name and there are cogent reasons why she should give this title a favorite place among the many by which she is invoked. First among these reasons must be her own devotion to the mystery of the Atonement, for it was by the death of her son on the Cross, which cost him the last drop of his blood and made her preeminently the mother of sorrows, that the wall of division between God and man was broken down and both were made one (Ephesians 2:14), through Christ’s atoning sacrifice. As the Blessed Virgin is inseparably associated with our divine redeemer in the mystery of his incarnation, so is she closely associated with him in the great act of the atonement. Thus, is she always represented in the Gospel and in the liturgy and thought of the Catholic Church as standing by the cross, when Christ was crucified there. There is a second reason, hardly less weighty than the first, why the title, Our Lady of the Atonement, should powerfully appeal to the mother of God. It was through the Incarnation she become the mother of Christ, but through the atonement she became the new Eve and the mother of all the regenerate, who being redeemed by the precious blood are predestined to eternal life as the adopted sons of God and heirs of the Kingdom of Heaven. The third time Our Lord spoke upon the cross it was to emphasize this phase of the Atonement, when he said to his mother: “Woman, behold your son,” and to St. John, “Son, behold your mother.” [John 19:26-27] Thus by virtue of the atonement Mary is the mother of all who live through Christ. Can anyone therefore possibly conceive the depth of significance this title “Our Lady of the Atonement” must possess for Our Blessed Mother herself? “My ways are not your ways,” [Isaiah 55:8] says the Lord of Hosts.